“If you don’t want him to hit you, then don’t smile,” Kristin said after I told Isaac to stop hitting me in the stomach. I pleaded my case, “It’s how he says, ‘I love you.’ I just wish he wouldn’t hit so hard.” I said that second part loud enough for him hear. Isaac strutted off like he’d won a boxing match. When I was first diagnosed with ALS, Isaac was nine months old, and I feared he wouldn’t remember me. I hardly have a memory before age six. The few memories I have before six are scattered, but enduring. I cherish memories wrestling with my father — he lost all of his strength if I could get his socks off. Seriously, removing his socks was like kryptonite to Superman. My dad told me to punch him in the stomach as hard as I could. “Go ahead; it’s pure muscle.” I marveled at the size of his belly muscles, and roundness. In somber reflection, I asked a friend of mine if he could teach Isaac to camp. I asked his uncle to teach him to hunt. His Papa would attend his sporting events. An old friend will visit next weekend, and I asked him to teach him to ride his bike. Those are all things that dads should do, but they don’t make a father. I remember my father worked hard. I remember my father reading his Bible every evening. I remember my father setting me straight when I was disobedient. Different dads have different gifts. 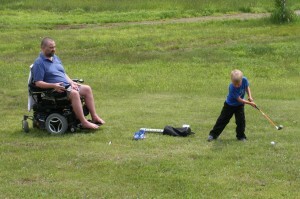 As life turned out for me, I’m not going to teach him to throw ball or to swing a golf club. My gift to him is to be available. To show him a will to live through overwhelming adversity. To show him how I can be creative and productive even when I don’t get paid for it. To show him how to treat his mother, sister, and future wife. To let him know he’s growing into a fine man. I tell him, “I love you,” by being available to be socked in the stomach. I just wish he wouldn’t hit so hard. This entry was posted in Uncategorized on June 21, 2015 by Todd Neva. Five years ago today, my life was divided into before and after a neurologist diagnosed me with ALS. A family friend had recently died of ALS. The disease ravaged his body, and it took him in just a year and a half. “How long do you think I have?” I asked. “We’ll have a better sense after a year,” he said. He told me if the disease progresses slowly, it will continue on a slow course. If it progresses quickly, then I will have less time than the 3-5 year average prognosis. I checked in with him every few months and he monitored my strength. One year after the diagnosis, I drove to the clinic and walked into the exam room. Kristin and I sat in his office with bated breath. My arms were much weaker. My lung capacity had declined. Now, five years later, I’m optimistic that I’ll have years ahead of me. I’m a quadriplegic in a wheelchair. I’m dependent on Kristin and equipment to transfer from bed, to chair, to toilet. I spend long hours at my computer with adaptive equipment. Because I have virtually no hand function, I eat at the kitchen island face-to-plate. “I’m eating like Dad,” Isaac said the other day. So what is my secret to longevity? Nothing. This disease ravages bodies indiscriminately and takes a different path for each. There’s little proven to extend life. But I do what I can — keep a positive attitude, pray for healing, take supplements, keep my weight up, and live an active life. Most of that might have a bigger impact in my disposition than it does on my prognosis. It feels good to try something, as long as it doesn’t break the bank. No matter what path the disease takes, it all ends the same — miserably. I dread that day, but it keeps me intensely focused on doing all that I can today. I worship my God. I love my wife. I engage with my kids. I listen to my friends. I’m active in my church. I eat great food with no regret. I laugh. I cry (as seldom as possible). I write. I have a full life. I can’t imagine how I ever had time to work a regular job. To celebrate the occasion, for the next month we’re lowering the price of Heavy e-book on Amazon to 99 cents. This entry was posted in Uncategorized on June 10, 2015 by kdneva. I’m in a faith crisis. I used to think life was working because I followed God. I went to Bible college and into ministry to make a difference in the world—I taught kids they can have eternal life through faith in Jesus and a better life here on earth doing things God’s way. I’m still trying to follow God, but life isn’t working the way I thought it was supposed to. I feel like a failure, because, when push comes to shove, I can’t live the Biblical truth I believed and taught to at-risk youth. I can’t get past my anger and sadness to the joy I thought he promised. I asked Todd why I don’t feel God’s comfort. “You’re swimming in the middle of an ocean asking what wet is,” Todd said. “You’re surrounded by the love of God, by his people, in his grace, but you don’t see it because you’ve never known anything else.” Todd knows how dark life can get because he wasn’t walking with Christ when he was in his twenties. He says our life isn’t dark. Friends tell me I am doing fine considering our circumstances. Todd tells me I am doing a good job taking care of him and the kids. “Why am I in a faith crisis?” I asked Todd. “Because you’re in crisis,” he said. Todd and I enjoy watching a spy TV series together. In one episode, a spy was captured by rogue agents. “Will he talk?” a young spy wondered if his teammate would break under the brutal torture techniques. “Everyone talks,” a veteran spy declared. Some of us are more resilient than others, but we all break. Victor Frankl poses a question to those who are suffering to help them gain perspective: What would you say to yourself when you are 80, lying on your death bed looking back on life? My story is one in a long line of broken stories. It is a minuscule subplot of God’s great story of redemption. As I have talked to others, I realized I am not the only one struggling to cope with the brokenness of this world. 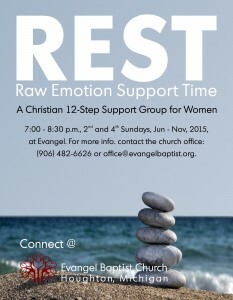 A friend and I decided to start REST, a Christian, 12-step support group for women who need recovery from the heartaches of life. Life can be brutal. It requires re-definition. It’s a hard process and we aren’t designed to go it alone. 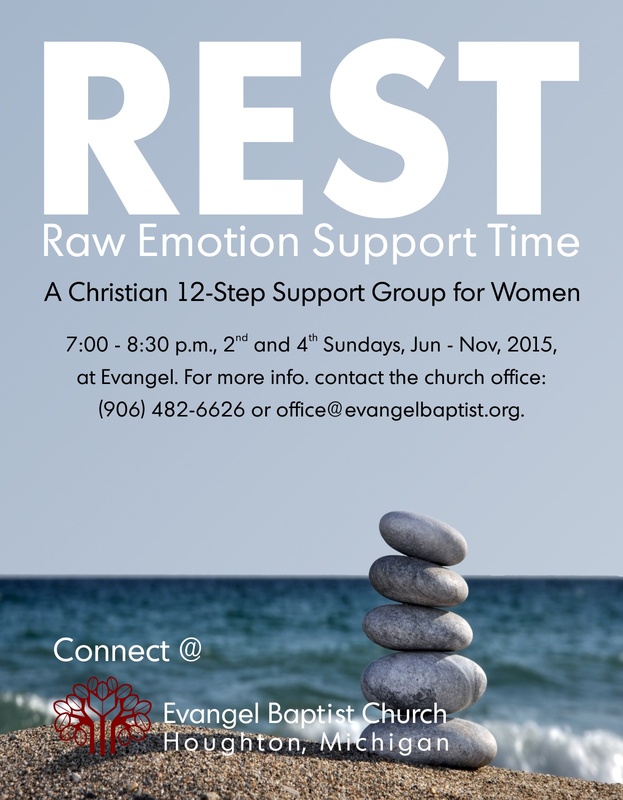 REST, Raw Emotion Support Time, will be meeting at Evangel the second and fourth Sunday evenings of each month, beginning June 14th and running through November. Pray for us—or join us. This entry was posted in Uncategorized on June 2, 2015 by kdneva.